Dr. Stevens utilizes media and technology to improve sexual health outcomes among minority youth. Ultimately, she strives to use research as a tool to achieve health equity, both locally and globally. She is currently an Assistant Professor of Nursing at the University of Pennsylvania's School of Nursing. She is also the Principal Investigator of the evaluation of Pascale-Sykes Foundation’s Strengthening Families Initiative, a multisite study on the impact of targeted social intervention on family and child wellbeing across Southern New Jersey. 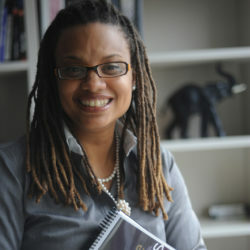 Dr. Stevens is also Co-Principal Investigator of Epic Camden; a unique mixed method study of the influence of geography, social institutions and interpersonal relationships on risk taking trajectory among urban youth. She is also co-investigator on an NIH funded study to develop and test a mobile phone based HIV/STI risk reduction intervention for young African American MSM. Dr. Stevens has presented her research nationally and internationally.She received her B.A. from Harvard College, M.P.H. from University of Michigan School of Public Health, and Ph.D. from the Annenberg School for Communication at the University of Pennsylvania.